BOB SO Final Result 2018 - Bank Of Baroda Specialist Officer Result/ Appointment Letter 2018 – www.bankofbaroda.co.in. The good news is that BOB SO final result has been declared. The list of selected candidate has been published on the official website. Earlier the interview for the posts of Specialist Officer was conducted on January and February 2018. The interview for trade finance was held from 22nd January to 3rd February 2018. The interview for IT security was conducted on 5th February 2018 where as where is security post code 10 was organised from 1st February to 6th February 2018. The final result of BOB SO has been declared now. The link to download BOB SO final result is given in the end of the post. Click on the link and a PDF file will be downloaded. Open the file in Adobe reader and search your name and father name or roll number in the selected list. T the candidates are advisedhe selected candidates are advised to keep ready their original documents such as educational documents, caste certificate if applicable, at the time of reporting to the bank. The candidates are advised to keep visiting the official website time to time for further notification of appointment and joining to be issued to the selected candidates. 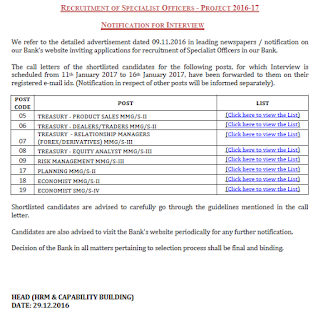 BOB Specialist Officer Appointment / Joining Letter 2018 - Bank of Baroda had uploaded BOB SO Admit Card 2018 on website www.bankofbaroda.co.in. The written test was scheduled on 07th January 2018 and intimation was forwarded to their respective email IDs of the eligible candidates. The latest news is that BOB SO Admit Card 2018 will be announced very shortly. The online card is expected to available in the last week of December 2017 on official website www.bankofbarda.co.in. Earlier BOB had released notification for 1039 vacancies of Specialist Officer (SO) and online application was submitted from 09th to 29th November 2016. Huge numbers of aspirants had applied for these advertised posts. Those candidates who have applied and are waiting for their BOB Specialist Officer Admit Card 2017 from direct link given here. Those candidates must score more than minimum cut off marks in each section as well as total test. The qualified candidates of online test will be called for psychometric test/ group discussion/ personal interview. The online test scorecard / marks will be declared after the interview result. The final merit list of selected candidates will be prepared from online test and interview marks. Bank of Baroda had uploaded BOB SO Interview letter 2017 on website www.bankofbaroda.co.in. The interview was scheduled from 11th to 16th January 2017 and intimation was forwarded to their respective email IDs of the eligible candidates. The latest news is that BOB SO Result will be announced very shortly. The online result is expected to available in Feb/ Mar 2017 on official website www.bankofbarda.co.in. · Go to official website www.bankofbaroda.co.in. 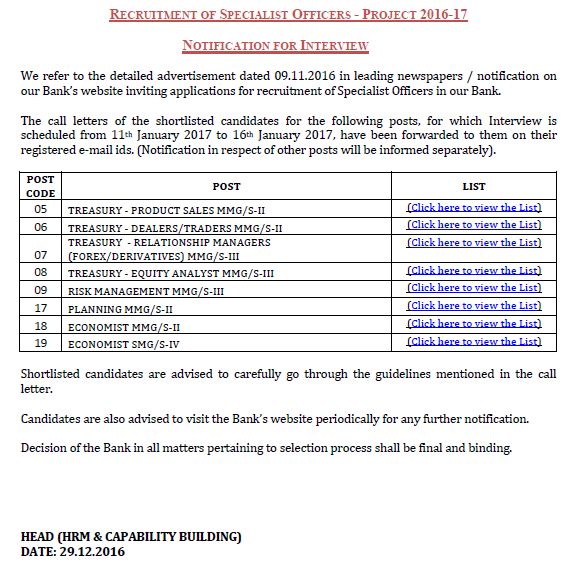 · Click on ‘Bank of Baroda Specialist Officer Final Result / Appointment Letter 2018’. · Enter Login ID and password and press submit button. Print BOB SO Final Result 2018 and verify all relevant details carefully.